Started in 1946, in a small downtown office in Battle Creek, Michigan, Dare Products has become a cornerstone in the industry—offering a full line of electric fencing equipment and other related tools and products. • Bury 12 To 24 Inches Below The Surface. • Heavy Cross Sections Stand The Pressure Of High Tensile Fencing. • Large Flange Prevents Shorts and Arcing. • Locks and Unlocks Fence Wire. • High Density Polyethylene With Carbon Black For Superior Uv Resistance. Complete With Galvanized Ring Shank Nails. • Multi-Purpose Fence Tool For Fence Installation. • All Purpose Fence Tool For Use When Working On A Fence. • Designed For 12 Gauge Wire, But Can Accomodate Up To 9 Gauge. • Fits 1.25 and 1.33 Lb/Ft T Posts. • Large Flange Prevents Arcing. • Solid Wire Holders Take Barbed, Electric Fence Wire and Polywire. Die cast zinc. Fits 1/2 inch to 1 inch diameter rods. . . .
• Aluminum Wire For Use In The Agriculture Market As Electric Fencing For Animal Control. • 17 Gauge, 250 Ft. Aluminum Wire Designed To Be Used For Any Purpose Around The Home Or Farm. • Stake Trees, Electric Fence General Uses. • Fits 1/4 To 9/16 Diameter Round Posts and 5/8 Fiberglass T Posts. • Extends Wire 1 From The Post. • Adjustable While Current Is On. • Screw Tight Round Post Insulator. • Yellow Fits 1/4 To 9/16 Posts. • Don T Be Shocked, Be Safe, With Rubber Gate Electric Fence Spring Gate Handle In Hard Hat Yellow. • Has A Firm Grip and Acts As A Layer Of Insulation. • Generous, Sensibly Spaced Flanges Allow Plenty Of Hand Room. • Enclosed Spring Stretches 3. 5 Inches To Keep Wire Taut. Install in fence line to periodically renew tension. Heavy cast cog with spring loaded latch. Hot dip zinc coated frame exceeds type iii specifications. No raw uncoated steel edge. Use no. 1701 handle to tighten..
• Poly Tape For Electric Fence 1 1/2 White, 656 Feet Per Spool. • 700 Lbs. Braking Strength. • Check Your Fence From Any Convenient Location You Choose. • Pocket Size 9 Overall Length. • Protects Horses and Other Valuable Livestock From Sharp, Jagged T Post Tops. • Large Heavy-Duty Cap/Insulator Can Be Installed With Wire Holders Facing Front, Back, Right Or Left. • Holds Wire, Polywire, Polyrope, and Polytape Up To 1.5 Inches. • Fits All T-Posts and Can Be Nailed On Top Of Wood Posts, Features Uv Inhibitors For All Weather Performance. • Molded, High Density Polyethylene. • Place Near Or On Wire To Warn Against Electric Fencing. • Two Holes To Nail On Post Or Hang From Wire. • 4 X 8 Black Lettering On Bright Yellow Laminated Vinyl. • Bungee Gate Kit For Wood Or T-Post Insulators, Stretches Up To 20 Feet, White. • U-Post Tape Insulator White, Fits 1 3/4 & 2 1/8 U- Post. 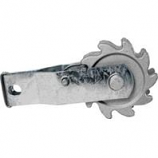 • End Tensioner For 1 1/2 Inch Poly Tape. • Old Fashion Style Insulators, Molded Of Modern High Density White Polyethylene. • Take Any Size Fence Wire. • Install Like Any Insulators. • Will Not Crack Or Shatter If Struck With Hammer. • Triple Grove Line Insulator. 25 Pack. • High Density Black Linear Polyrthlene For Sunlight Resistance. • Operates Well In Any Climate In Any Part Of The World. • High Density Black Linear Polyethylene For Sunlight Resistance. • Operates Well In Any Climate, In Any Part Of The World. • 45 Degree Slot Easily Accepts Any Fence Wire and Holds It Is Place. • Heavy Duty Cutout Switch For Electric Wire Fence. • Locate Along The Fence Line Or A Strategic Locations Allows You To Turn Off The Fence Without Returning To The Energizer. • Conducts Electricity 4 Times Better Than Galvanized Steel, Weighs 1/3 The Weight Of Steel. • Excellent For Temp Fence. • Use With Any Energizer Except Weed Burner. • Easy To Twist and Tie Off, No Special Tools Required. Has A Firm Grip and Acts As A Layer Of Insulation. • Fits 1.75 To 2.125 Wide U Posts. • For Poly Tape Up To 1.5 Wide. • U Post Insulator For Polytape Up To 1.5 Wide. • Measures 4. 75 Inches Between Flanges. • Heavy Stamped Steel Hook. • Insures Long and Trouble-Free Life. • High Quality, High-Impact Styrene, Plated Metals Parts. 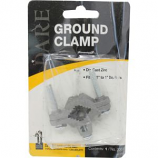 • Provides Insulation For 90 Degree Turn Or End Loop On Any Style Post. • Heavy Sidewalls Provide Extra Protection Against Shorts Or Grounds. • Metal Insert Is Designed To Take High-Tensile Strain. • Tubular Corner Post & End Post Insulator. • Molded Of Polyethylene With Carbon Black To Withstand The Elements. 19.5 Long. • Under Gate Lead Out Cable. • 50 Ft. Spool Of 12.5 Galvanized Aluminum Underrate Lead-Out Cable. • 80 In. Coating Rated For 40,000 Volts. • Very Flexible and Easy To Place In A Trench. • Corner Tensioner For 11/2 Inch Polytape. • Universal Tank Watering Valves Convert Tanks Or Barrels Into Automatic Stock Waterers. • Requires Little Attention and Keeps Open Tanks Filled With Freshwater. • Low Priced, Efficient and Reliable. • Withstands Weather and Abused. • Durable Molded Float. Economy Model 300 Gph. • Fits Any Watering Tank-Poly Or Steel. • The Extra Length Snug Insulator For T Posts Is Designed To Perform With Solid State Electric Fence Shockers. • Features Up Inhibitors For All-Weather Performance With A Large Flange That Prevents Arcing. • Extends Wire 2 Inches From Face Of T-Post. • Snaps On and Around Post. Molded Of High Density Polyethylene. • White T Post Tape Insulator, Fits 1. 25 & 1. 33 Post. • For Any Polytape Up To 1.5 Wide. • Insulators Grip Tape Tightly To Prevent Whipping and Sawing. • Heavy Tape Holder Unlocks To Aid Installation. • Wood Post Insulator For Tape. • Molded Of All-Weather High Density Yellow Polyethylene.